JOSH STAUNTON believes that his Woking side can beat anyone after keeping back-to-back clean sheets in the 1-0 win at home to Dagenham & Redbridge on Saturday afternoon. The Cards stay third in the National League after Regan Charles-Cook’s 76th minute winner separated the two sides in a close encounter at the Laithwaite’s Community Stadium. After the game, Staunton has sent a warning message out to other teams in the league after his side moved just a point off the top of the table. Woking have had injury problems of their own this season, with defenders Louis Ramsay, Nathan Ralph, Joey Jones, Fabio Saraiva and Richard Orlu all absent. Lazar Stojsavljevic made his full debut at left-back, whilst Jordan Wynter, who signed in the summer as a midfielder, put in another commanding performance out of position, which made the clean sheet even more satisfying to the former Dagenham and Redbridge defender. Woking boss Anthony Limbrick echoed the thoughts of his defender, and praised the work of Scott Harrison and Jane Spong at the Academy, with Charlie Carter and Declan Appau also in the squad. “He’s got good size, good physicality, he’s left-footed, he can head it and he made a lot of clearances doing the defensive job of a left-back really well and for someone who comes in in a game like this against season pros and perform the way he did was a credit to him. Wynter had another assured performance and was named in the Non-League Paper’s ‘Team of the Day’ and earned the plaudits of his manager after making this position his own. 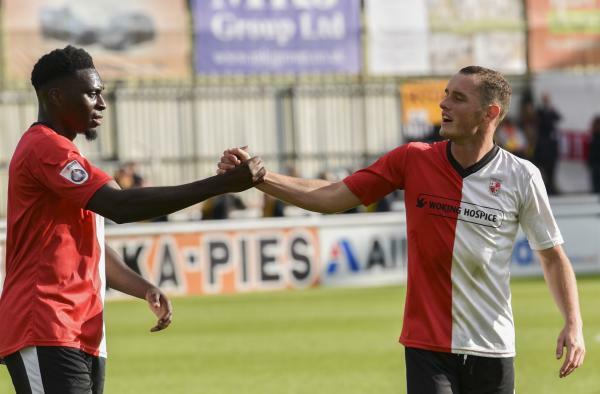 Finally, Matt Young has flourished since coming into the team after the injury to Ramsay in the win over Sutton United last month, and Limbrick made sure he praised each and every one of his defenders. “He’s got a superb attitude, he’s always working hard, wants to develop his game he’s great with the boys and he really gets the team spirit going amongst the group so we’re pleased for him.